Krishen Khanna born 1925 at Lahore did his schooling on a scholarship in England and graduated from the Government College Lahore, before turning to learn art at Sheikh Ahmed’s Studio at the Mayo School of Art when he also joined a printing press there as an apprentice. In the wake of India's partition he moved to Simla but shifted to Bombay to take up a job with Grindlays Bank only to give it up later in order to pursue his passion for art. Known for his masterly paintings of the human condition, reflected in deft strokes that heighten the emotional content of the people and situations portrayed, Krishen Khanna’s art is marked for his skillful drawing and play with pigments using knife and brush. Krishen Khanna born 1925 at Lahore did his schooling on a scholarship in England and graduated from the Government College Lahore, before turning to learn art at Sheikh Ahmed’s Studio at the Mayo School of Art when he also joined a printing press there as an apprentice. In the wake of India's partition he moved to Simla but shifted to Bombay to take up a job with Grindlays Bank only to give it up later in order to pursue his passion for art. Known for his masterly paintings of the human condition, reflected in deft strokes that heighten the emotional content of the people and situations portrayed, Krishen Khanna’s art is marked for his skillful drawing and play with pigments using knife and brush. He received the Rockefeller Fellowship in 1962 and later also did a stint as Artist in Residence at the American University in Washington. The themes for his large body of lyrical work include biblical subjects, truck series, village folk and of course the bandwallas amongst others. Closely associated with the Progressive Artists' Group he had his first show in Mumbai while posted in the city, when he sold his first painting to none other than Dr. Homi Bhabha for the Tata Institute of Fundamental Research and has not had to look back since then. With numerous shows and representations in India and internationally including the Tokyo Biennale, the Sao Paulo Biennale, the Festival of India in USSR and Japan and the Venice Biennale, his work is held in important public, corporate and private collections including the LKA, NGMA, the British Council and the ITC group. Winner of the Lalit Kala Akademi National Award, Lalit Kala Ratna and Gold Medal at the First Triennale India Krishen Khanna has been honoured with Padma Shree by the President of India. He has held several important positions in decision-making bodies of the Lalit Kala Akademi, National Gallery of Modem Art in Delhi and Roopankar Museum at Bhopal. His work includes several large commissioned murals including one that adorns the foyer ceiling at the Maurya Sheraton Hotel in Delhi. Krishen Khanna’s contribution to the Indian art scene has been documented in several publications including a special book. 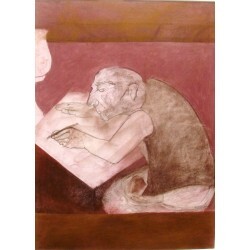 The artist currently lives in Gurgaon in the vicinity of Delhi and works from his studio at home.